We've been covering this adaptation for a few years now, so it's great to see it finally speeding towards the finish line. The first trailer and a fresh poster for the Stephen King adaptation of "Cell" has landed and it looks decent. We also have release dates! Cell hits Ultra VOD June 10th and then theatrically and on VOD July 8th. Directed by Tod â€œKipâ€ Williams (Paranormal Activity 2, The Door in the Floor), Cell is based on the apocalyptic novel of the same name by Stephen King, who adapted the screenplay along with Adam Alleca (The Last House on the Left). 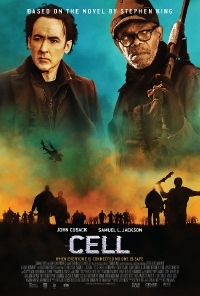 Cell stars stars John Cusack, Samuel L. Jackson and Isabelle Fuhrman (Orphan, The Hunger Games).